The current TV in the salon works well, however you can see the amount of space that is taken up by the back of the television. 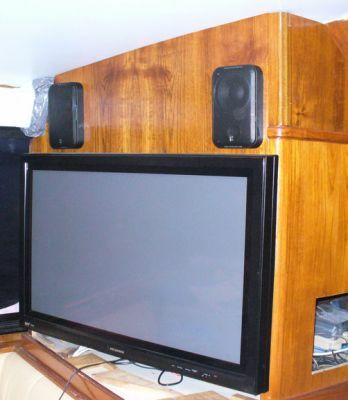 Mounting of a flat-screen would give us another area for storing galley items/dvds/cds/etc. The area taken up by this 27" conventional TV should allow installation of a 32" to 37" flat-screen mounted and hinged for access to the cabinet behind. 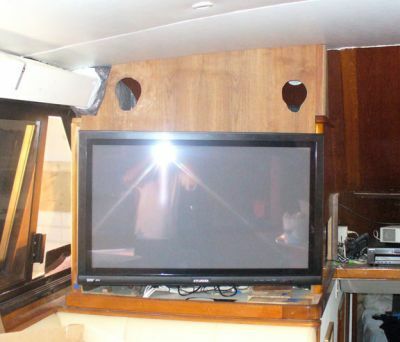 The trick is finding a Flat-screen that will handle the rigors of the boating enviroment. We found a great deal on a digital 42" Plasma TV. This door with inset was fabricated and then fastened using a piano hinge. 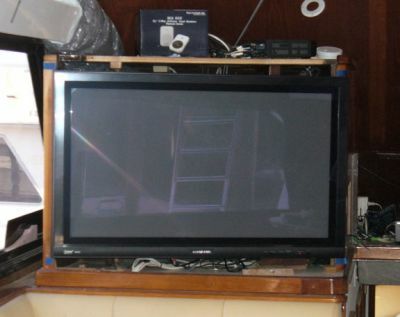 A block was fabricated and installed to support the lower right side of the door because of the weight of the TV (over 90 pounds). This is the largest TV that could possibly fit (it's bigger than Art's!) as you will see . . . 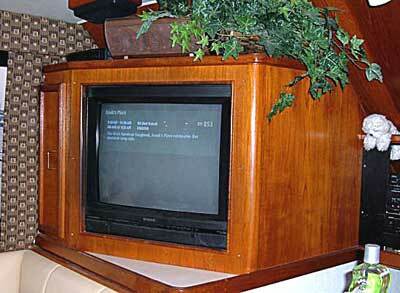 The TV fills the entire cabinet, which had originally housed stereo speakers too. 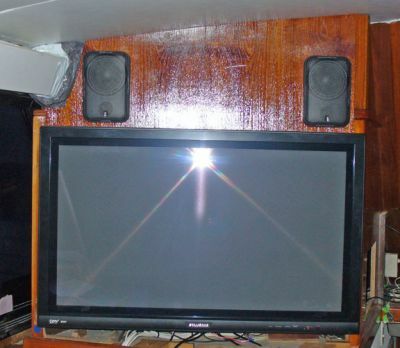 Because our boat sound system made the stereo speakers unnecessary, we removed them. 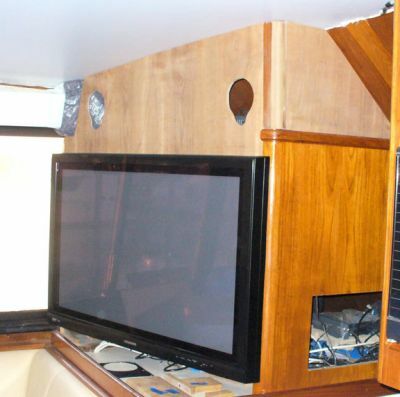 A teak box was constructed to frame the TV and create a place for the two 200w Poly-Planer speakers which will be mounted. These headliner speakers, along with two directed at the L-shaped couch and two sub-woofers, should give the sound we are looking for. This just shows another view of the TV and frame (not yet varnished). The Corian countertop will be at the bottom of the TV with a small lip toward the back. This will still allow air to flow inside. 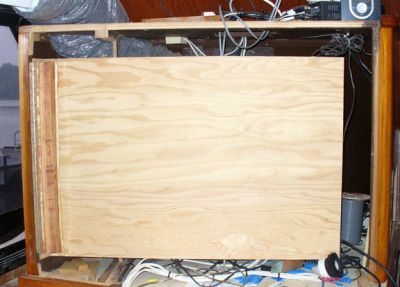 Also, we added 1/2" strips on the plywood door, for air circulation, before bolting on the TV. Several coats of varnish have been applied and the speakers are now in place. One more sanding and varnish should give the look we want.